Liberty print is always in style. The iconic prints (acclaimed since 1875) are about as much about how the wearer chooses to wear them (clashing print on print, a subtle dash or a statement piece) as about the colour and layout of the print itself. Yesterday, Liberty showcased the work of James Millar [ex Jonathan Saunders and Loewe] and his new direction of embracing geometrics and paisleys from the Liberty print archive and new collections as well as the ubiquitous ditsy florals. Shirts, scarves, ties and pocket squares all carried the same prints through out, often in clashing or contrasting colourways. 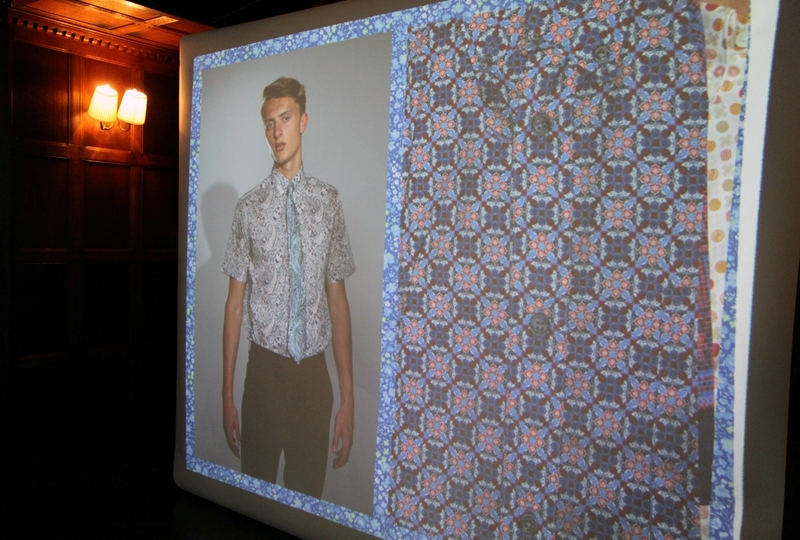 The spring summer 2013 menswear collection reflects the Liberty origins by drawing upon the extensive Liberty print archive, reinterpreting it in an entirely contemporary and innovative way. 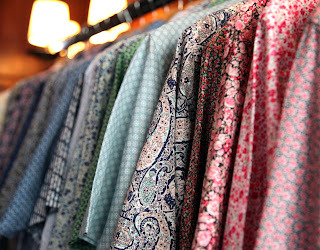 The collection comprises shirts; ties, pocket squares and scarves all constructed from both archive and entirely new Liberty prints. The same prints run through all four elements of the collection in complementing and contrasting colourways enabling the wearer to layer up and be bold with pattern and colour. Shirts make up the backbone of this collection and form a foundation on which the accessory elements can be layered. 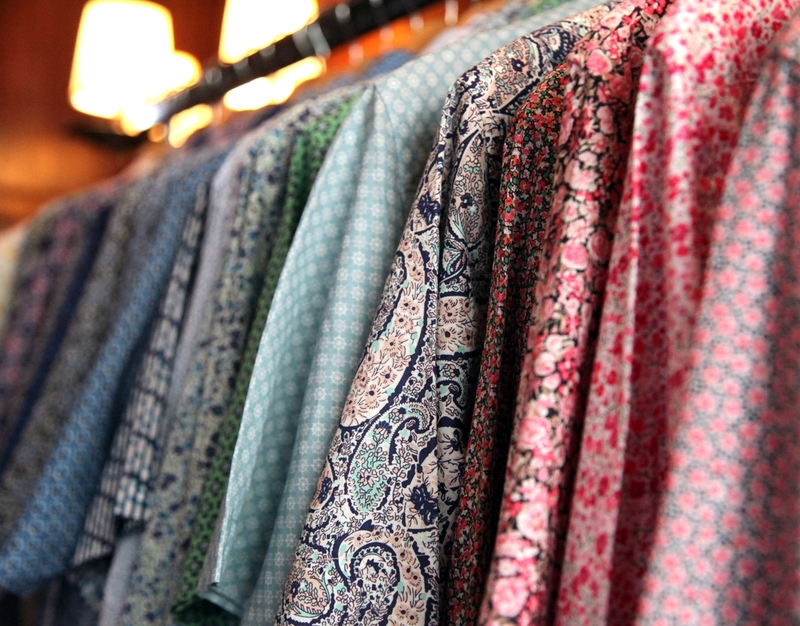 Liberty’s ubiquitous florals are accompanied in the collection by paisley, geometric and feather prints. Short-sleeved shirts are (naturally) rife in the S/S’13 collection. With the print Juno the art nouveau peacock feather motif takes on an entirely modern incarnation with just the eye and the tip of the feather being used to create an intricate and detailed pattern. Classic paisley archive print Bourton comes in both its original form and a completely new and very striking check where miniature squares of the paisley print in bold clashing colourways are patchworked together. Rosa as its name suggested is a print consisting of the head and stem of a bloomed rose, first designed for Liberty in 1997 this print looks resplendent in the yellow colourway on a short-sleeved shirt. Glenjade was first designed forLiberty in the stylish 1930s and is a detailed print made up of miniature leaves that connect together as if on stalks. Claire Aude is an abstract floral designed for Liberty in 1975 available in a vibrant coral colourway on all styles of the shirts in this collection. 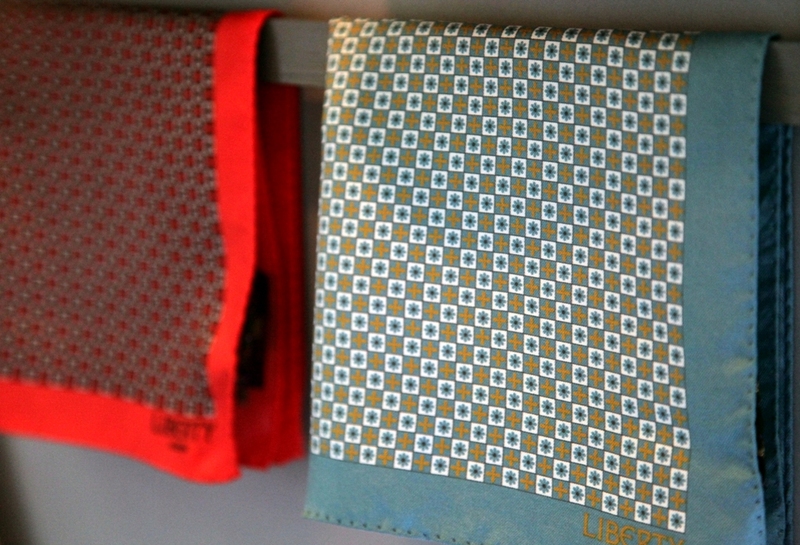 Dan and Criss Cross are two geometric prints prevalent in the collection. Dan a print from the Liberty archive has the look of a 1950s geometric formed of rows of dots and crosses. Criss Cross is a new print for 2013; a Celtic influenced cross is bordered with a linear design that is post-modern in its feel, available in a sort-sleeved shirt in a bright green colourway. 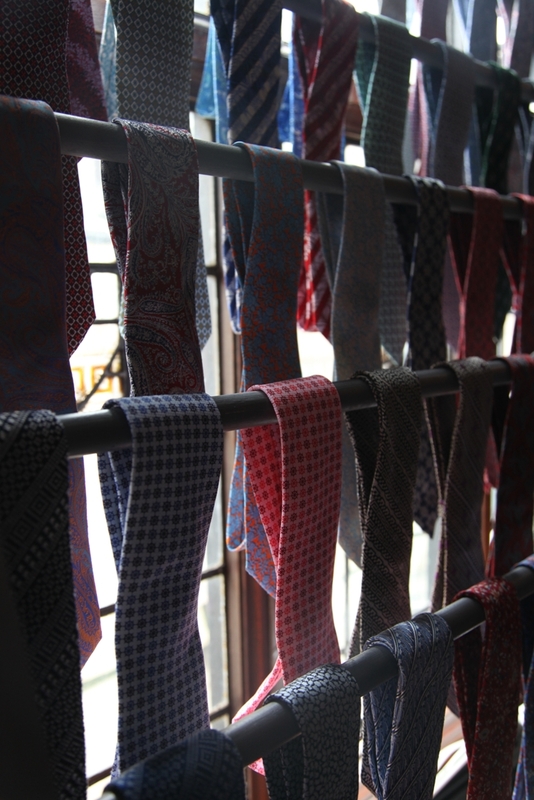 Scarves take pride of place in the Liberty flagship store as well as forming an integral part of this menswear collection. Labyrinth; a mosaic print with strong Hellenic overtures has ‘Liberty’ written on it where Liberty becomes part of the print itself while Fleur de Lis is a busy geometric print with an eponymous motif running through it that comes in a modal cotton mix scarf. 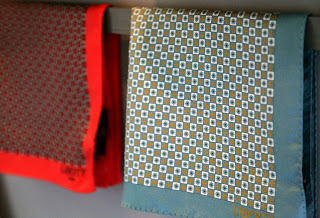 Ties are a popular choice to begin experimenting with print. Available in skinny and regular width, Liberty ties are 100% silk aside from two new styles of knitted ties that are a silk and wool mix. Chic pocket squares come in 100% woven Italian silks and feature a highlight of the whole collection’s most detailed prints. Contrast print diagonal corner reflect the tie collection. Prints Glenjade and Juno appear again here in contrasting and complementing colourways to the shirt collection. Eastwood Spot is a bold paisley with a polka dot background base. Christelle is a 1992 ‘Tree-of-Life’ influenced print based on the early Indian chintzes that first came to Europe in the 17th century and was originally printed on scarves, it is available on both a pocket square and tie in deepest black on a rich navy background. The Liberty of London Spring/Summer 2013 menswear collection will be housed in Liberty’s iconic Tudor Building on London’s Regent Street as well as prestigious stores worldwide. This is really nice post i like it a lot shirt style is outstanding.Great job.Thanks for sharing.